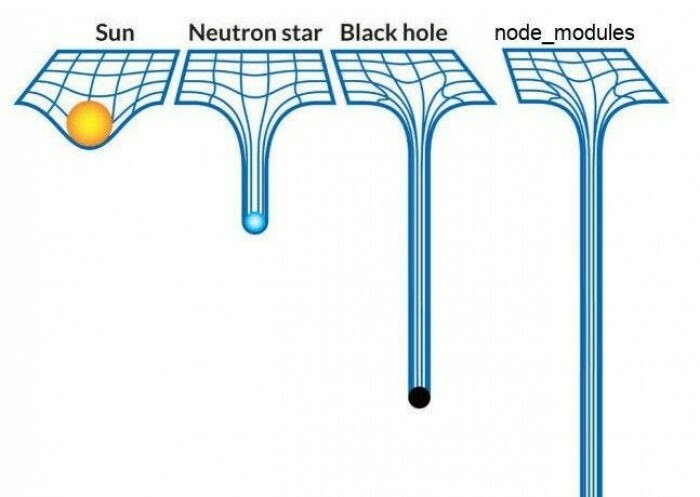 node_modules folder vs black hole joke, a classic! These can stay in the git repository. Anyone who needs a closer look on your module, how to use it, needs examples, can find it there. Contributors will also use the git repo as the source of code, where development is done, and tests are ran - they don’t need those in the distributed package. To tell npm what should be packaged, use the files field in the package.json. Content of files is an array of files and folders, relative to the package.json file. List your folders and assets that are part of the module, or need for installing or building code if necessary. Is your module targeted for the browser, or node, or both? The main and the browser fields in your package.json file are here to help you define which module is targeted for the browser and which one is for Node.js within the package. According to the specs on package.json files, bundlers should parse and use the content of the browser field. It can be used to provide an alternate main entry point to the package itself, or just replace parts of the package when the bundler loads it targeted to browser environments. Recently the module field got introduced, where you can point bundlers towards your code, which is in the new ECMAScript Modules format. Do not put the tools needed for development in the dependencies field. This is very important, because if you do, every install of your module will bring tons of modules not needed for your package during install. This wastes disk space, network traffic and time. It’s possible to build your code on install, but that should be limited to node bindings and code that actually need to be compiled on the target environment. But please don’t build/bundle js code during the install cycle. Since we’ve touched the topic of development tools, let’s dive into those a bit deeper. Usually, a development toolset relies on globally installed modules, which is fine and a quick way to go. But as your team grows, or other contributors join your project, it’s not sure they all use the same toolset, and it just feels wrong to force them to install some libraries globally. To solve this, you can list these tools in devDependencies, npm installs them locally, and you can invoke them from your npm scripts. Executes command either from a local node_modules/.bin, or from a central cache, installing any packages needed in order for command to run. "babel": "./node_modules/babel-cli/bin/babel src --out dist"
"babel": "npx babel src --out dist"
do not sudo. Not every user has the same privileges on their workstations. Be careful what you implement here, as they run on every install run, even if it’s not your module that’s been installed. Check for the ENV vars, to see what’s happening during the install phase. Suppose your code is done, built, tested and ready for publishing by now. Awesome, you’re doing great! If you like named releases, nice version numbers, use those for your customers, but developers and the npm registry will use semver. Update it every time your code changes in any way. Your code is ready to go public, if you run npm publish it will be published to npm, and don’t forget to run git push —tags, to push the created version tag to the repository. You don’t have to stress about forgetting something, like a build step or some parameter. Its a controlled and automated process, and team members can join in easily. Stephan Bönnemann came up with this great tool called semantic-release a few years ago. It’s an automated versioning and release tool, that creates the version number and the changelog by parsing your git commit messages. The ultimate release automation - check it out! Let’s say you encounter a bug in your module, you fix it, release it, and want to encourage everyone to use the new version. npm can help you with this by allowing you to deprecate module versions. You can deprecate certain versions, or complete version ranges if necessary using the npm deprecate command. npm deprecate my-module@1.0.3 "this version is not supported any more, pelase update"
# mind the double-qoutes around the version information! npm deprecate my-module@"< 1.0.4" "critical bug fixed in 1.0.4, please update"
After detailing what to publish and how lets take a quick look at the “Where to publish” part. Here’s a quick start guide to scoped packages. If your organization needs one, private registries are available by npm, called npm enterprise. Its a self-hosted solution (you have to install/maintain the server) or use it as part of npm’s SaaS products, and let them host it for you. Private registries are great for closed beta tests, or if your packages/modules are protected intellectual property (IP). You can have custom authentication methods, like LDAP, and you can define who can access the registry at read/write level. They even have the capability to create mirrors of one another, so you can set up a high availability cluster of your own npm registry if necessary. These registries can also function as a cache server between your CI environment and the official npm registry. This ensures, that your builds always have access to the npm packages you use during a build. I hope I could provide some useful tips for everyone regardless of your npm-fu - if you have any questions, feel free to hit me, contact details are down below. Posted on 2018, February 26th , tagged as npm, packages .